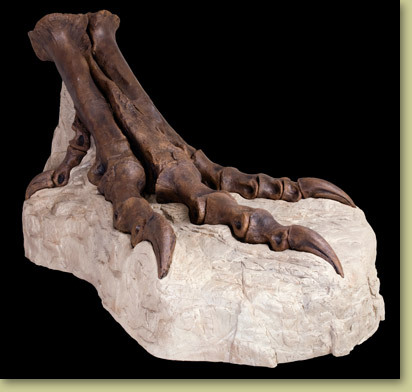 'Theropod', literally translated, means ‘beast feet,’ Tyrannosaurus rex certainly fits this description. STAN’s foot is about 3 feet long! The T. rex heel does not touch the ground and although spring and rebound cannot be accurately assessed, the raised heel indicates it would have used these actions for increased speed. Our specially designed base supports each individual bone and claw in a bone-shaped 'footprint' pressed into the 'matrix mound. This design encourages children to use critical thinking skills in order to place them in the correct position and orientation. When completed, comparisons can be made between the size and shape of this enormous foot and those of other dinosaurs, or to that of your own. STAN's foot assembly provides hands-on opportunities for developing motor skills, visual recognition, and learning about osteology. Go to STAN's Interesting info page for more in-depth info and pictures. Notes May take approximately four weeks for delivery. Check with us to see if an earlier delivery is possible.